In February 2015, EnviroCom Australia coordinated and delivered the second round of Early Learning Years Waste Education presentations on behalf of Western Downs Regional Council. Twelve of the region’s Early Learning Centres (ELCs) engaged in the free waste education program covering presentations on waste and recycling, composting and worm farming, and litter. These presentations supported the Early Years Learning Framework for Australia as well as assisting centres in meeting and/or exceeding aspects of their National Quality Standards. Feedback received from centre staff who participated in the program indicated that the children and staff now have more motivation and knowledge to reduce waste and recycle correctly. In addition to the presentations, EnviroCom staff also facilitated, for the first time, a Professional Development Sustainability Workshop for Early Years Educators. 24 staff members attended the evening workshop. The workshop provided the participants with education and training to encourage waste management and minimisation practices within their centres. All Centres that attended the PD workshop were provided with a free copy of EnviroCom’s Early Years Learning Resource Kit. 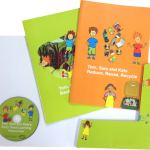 The Early Years Learning Resource Kit provides ELCs with separate, but integrated, education tools and resources allowing them to independently identify opportunities to minimise waste as part of centre operations, while at the same time delivering complementary, engaging and relevant education to the children in their care. Feedback received from the workshop participants suggested the PD workshop was very informative and the Early Years Learning Resource Kit provided staff with the tools and ideas to improve their current waste management practices. To complement the release of The Early Years Learning Framework for Australia, ‘Belonging, Being and Becoming’, EnviroCom has developed an Early Learning Years Environmental Education Resource Kit. This kit primarily addresses waste management and provides Early Learning Centres and Kindergartens with the means to independently assess and improve their current waste management practices through provision of a waste calculator tool. 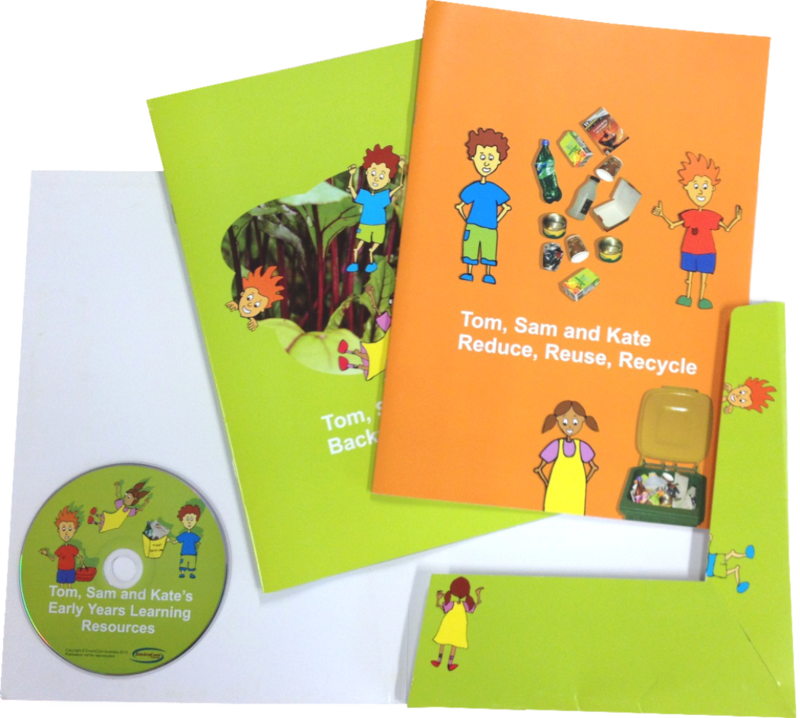 The kit also incudes resources for children, including two interactive picture story books: ‘Tom, Sam and Kate Reduce, Reuse, Recycle’ and ‘Tom, Sam and Kate’s Backyard Adventure’. The books include complementary follow-on activities, as well as extension activities for facilitation by group leaders encouraging open-ended play experiences and opportunities for intentional teaching. The kit also includes reinforcing tools such as posters. To assist uptake of the Kit, EnviroCom’s trained facilitators can run PD sessions for Centre staff to train them in how to effectively use the Kit and get the most out of it. Contact EnviroCom today to find out more! EnviroCom Australia delivered three regulated waste training sessions to staff and contractors from Tarong Power Station, Tarong North Power Station and Meandu Mine (Stanwell) to assist in ensuring continued legislative compliance in regulated waste management and tracking. The practically focused, small group training sessions were delivered onsite and customised for the specific site needs and wastes generated. The delivery of customised site-based training can be used to assist in addressing complex compliance issues by cutting through the regulatory jargon and focusing on the specific needs of a site, a project or an event. This process is best applied where detailed consideration of the waste generation composition and behaviour has been undertaken. EnviroCom can assist any of our customers to assess waste composition, waste generation behaviours, regulated waste generation, waste management planning and develop site specific training or other interventions to address efficiencies, resource loss, resource recovery and compliance goals. EnviroCom, in partnership with Sunshine Coast Council’s Environment and Sustainability Department, developed and delivered a series of training workshops for staff across the organisation. The main objective of this project was to engage and train a Waste Champion from each department or branch, through a ‘train the trainer’ style workshop. The workshop was designed to cover both a broad range of issues related to waste generation and disposal as well as an understanding of barriers to and motivators for behavioural change. Feedback indicated that the workshop provided a great balance of information and skills-based learning, which translated into action as participants felt confident to train their teams in how to engage with Council’s internal waste management system and other waste minimisation techniques. A second series of workshops is planned for later in the year, with Waste Champions to monitor progress at follow-up meetings. As part of its Business Waste Reduction Program, NetWaste engaged EnviroCom to collaborate with the 28-Council wide network of Councils in order to devise a comprehensive program that engaged residents and staff at Ascott Gardens, an assisted living facility for the elderly, to achieve lasting sustainable outcomes. EnviroCom, in partnership with NetWaste’s Environmental Learning Advisor, offered facilitation and educational assistance to Ascott Gardens in order to establish a successful recycling program and achieve waste reduction goals. The program consisted of several components, beginning with survey distributed to staff and residents, designed to gauge the level of understanding and awareness around waste and recycling issues, as well as to obtain insight into the barriers for correct recycling behaviours. A visual inspection was conducted to take examine current practices. Several meetings were conducted to provide stakeholders with outcomes of the initial project phases. Cleaning staff were consulted directly for their feedback, as their participation and ownership of the program was considered imperative to its success. Information seminars were delivered to staff members and residents in separate sessions to provide guidance on specific waste and recycling issues; these were complemented by educational resources including a 12-page booklet targeting staff, newsletter inserts for residents, and a range of pictorial signage for display throughout the facility. The program was successful in achieving a number of positive outcomes, including a reduced frequency of waste collection. The newfound awareness of staff and residents has been credited with inspiring a wider range of other environmentally conscious behaviours within as well as external to the facility. EnviroCom”s substantial experience in the industrial sector, coupled with knowledge of best practice waste systems and organisational cultural change, has been utilised by Stanwell Corporation, primarily at Stanwell Power Station (SPS) west of Rockhampton, since 2008. Coinciding with the introduction of an integrated waste management plan for the site, EnviroCom has provided on the ground services to ensure effective and compliant management of waste via waste audits, waste systems advice, contractor liaison and delivery of environmental training. This has been supported through reviews of waste management policies and procedures, including the handling and tracking of regulated and hazardous wastes. Since 2010 EnviroCom has also provided on the ground waste advice during station outage (shutdown) events, assisting SPS to effectively manage increased waste volumes and an expanded workforce over this period.